From your best PLAX view rotate the probe 90 so the marker points towards the patient’s L shoulder. Sweep angle of probe to get views at aortic (anterior), MV, papillary and apex (posterior). LV area in diastole and systole (ignoring papillary muscles) to calculate fractional area change (a measure of systolic function). Anterior and posterior leaflets visible. Note thickness, mobility and calcification. Look for LV function, RWMAs and RV size. Can measure MV orifice in systole with planimetry. Over MV to look for precise position of regurgitant jets. 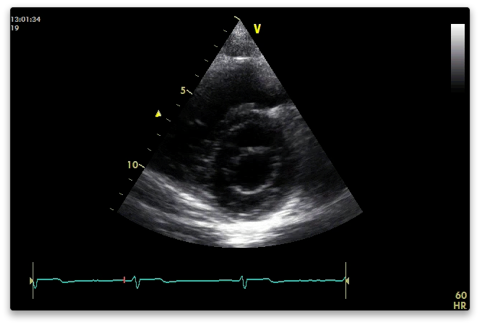 AV - should be tricuspid. Right, non and left coronary cusps as above (Royal National Lifeboat). Thickness, mobility and calcification. Look for thrombus in RVOT and PA if PE suspected. Proximal RVOT diameter immediately above the AV (should have already measured this in PLAX). TV - inflow and regurg. PV - stenosis and regurg. Vmax of forward flow to measure peak gradient and calculate stenosis. VTI (trace doppler forward flow) for mean gradient. Vmax of any regurg (align with jet) - TR for PASP and PR for PA pressure - PR Vmax end diastole for end PADP and PR Vmax early diastole for mean PADP. PW in TV and PV inflow - trace VTI which will measure mean gradient. Measuring the VTI just proximal to the PV will also allow stroke volume (SV) to be calculated provided the RVOT has been measured at the same point.